Continuity mistake: Right before Ernest falls into his trash truck you can see that it is full of a good mixture of trash, i.e. white trash bags, food containers, etc. But when the camera angle cuts and he lands in the trash, it has now changed to all cardboard boxes. Revealing mistake: When Ernest's jack flies out from under his truck it breaks the back windshield of the mayor's car. Watch closely and you can see the glass shatter before the jack makes contact with it. Visible crew/equipment: When Kenny's dad drops Kenny off at the party, you can see a crew member in a ball-cap reflected off of the glass. Visible crew/equipment: While Ernest is falling out of the back of the garbage truck in the beginning, the crew member's leg kicking the block of garbage on top him is visible for an instant. Revealing mistake: At the end, when Trantor shoots flames out of the ground to stop the crowd, the ground is split apart wide enough for the flamethrower to shoot flames out. The ground never shook apart or anything, because they show the ground before the flames shoot out and it's already split. Revealing mistake: When Trantor scratches the roof of the truck trying to get to Ernest, you can see that it is cloth ripping instead of the metal on the roof. Continuity mistake: When the troll eats the shells from the Sherrif's gun, he only eats about five or six, yet he fires over twice that many. Continuity mistake: When Ernest is in the barrel and rolling down the street Tom sees him and says "Watch out Bobby!" 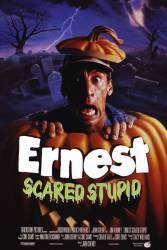 and puts his hands to his face but in the next shot when you see them run Ernest over his hands are down. Revealing mistake: When Ernest picks up the hedge clippers in the back of his truck to attack Trantor, you can see where it is supposed to be sliced off at before Trantor cuts it off. Continuity mistake: When Ernest is thrown into the concession booths at the party, he is covered in ice cream. When he leaves in his truck, he is not covered anymore. Continuity mistake: When Ernest leaves there are several bikes outside of the school, yet when Old Lady Hackmore leaves, there is only one bike (the one she takes). Continuity mistake: When Joey throws the first pizza at the two Murdock brothers there is already a pizza on the ground. Ernest: How'd you do that? Kenny: It's the milk! It eradicates them. Ernest: Yeah, gets rid of them too.